I gained such a new appreciation for Navy Seals after listening to this audiobook. 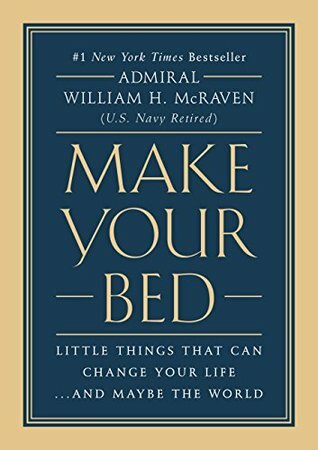 This is a short book talking about lessons Admiral William H. McRaven learned during his career as a US Navy Seal. The title originally caught my attention because I, too, make my bed every morning. I love climbing into a nicely made bed, and this was the first lesson talked about during the book. Part of the training for becoming a Navy Seal is to look professional, and that always included the barracks. Each individual was to make their bed pristinely every single morning. I liked that this is what the book started with because the idea behind it is this: if you make your bed, no matter what, you’ve started your day off with finishing a task. It’s simply that you can have something positive done right at the beginning of your day. Plus having a nicely made bed is so much nicer to sleep in, and makes your bedroom look 100x more organized. I liked the advice given throughout this book, but I found some of it to be pretty generic. I was intrigued by the stories the author told about his life in the Navy. I knew it was intense, but not as intense as he was describing it. There is literally no way that I could do half of what he had to endure. Anyway, I liked the stories even though the advice was a little average. There were moments that I was getting chills or getting teared up because of some of the stories. I think I’m just becoming a big softy, but I almost started crying multiple times just because something was so touching. I’ve come to really love self-improvement books because there is ALWAYS something to be gained from the advice given. I love having positive information in my ears as I walk on campus during the day. Yay for the first book of the year!